Our recipe for Roast Pork with Puttanesca Sauce is made for easy entertaining. 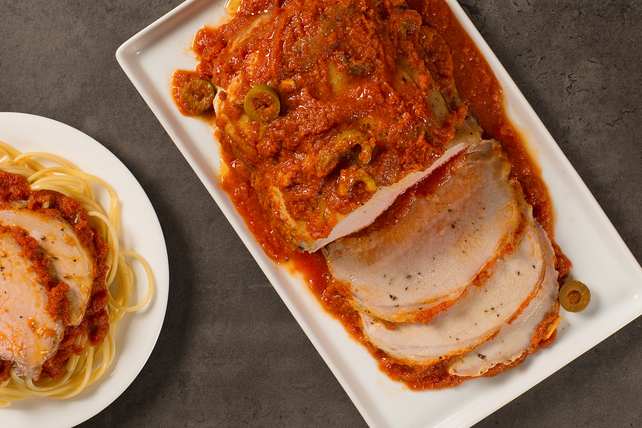 The CLASSICO Riserva Puttanesca Pasta Sauce teams up with the white wine to give this pork roast its authentic Italian flavour. This restaurant-style Italian comfort food is sure to be enjoyed by everyone around the table. Cut 1/2-inch-deep slits into top of roast. Season with salt and pepper. Melt butter with oil in large ovenproof skillet on medium-high heat. Add meat; cook 8 min. or until evenly seared on all sides, turning occasionally and reducing heat if necessary. Pour wine over meat. Bake 1 hour or until meat is done (160°F), topping with pasta sauce after 30 min. Cover meat. Let stand at room temperature 15 min. before slicing. Serve topped with pasta sauce from pan. Serve with hot cooked pasta, polenta or rice. Top with torn fresh basil leaves before serving. For best results, do not trim any fat off the roast before seasoning and baking as directed. Substitute alcohol-free white wine or reduced-sodium chicken broth for the regular wine.